Other excerpts from the memoir have highlighted the fact that for me, story creation is like a guided dream. I usually discover later that my stories have been helping me work through issues that matter to my conscious and unconscious mind, in the way that Carl Jung suggested dreams did. Today’s short excerpt, taken from page 259, provides another example of that “dream” imagery. On a cool day in November, Joe was away on one of his trips. Once again, my cats lounged beside the big brown armchair while I typed on my laptop, black words against white. But I wasn’t seeing black and white. Martin and Chip, his computerized German shepherd, were standing in a parking lot full of derelict cars. What does a parking lot look like, I wondered, when it hasn’t been used for fifty years? Not like a parking lot anymore. The rust-colored cars weren’t on asphalt. Weeds had sprouted and sprung up. No, not weeds, summer wildflowers. The cars were almost buried in big dense groups of yellow Maximilian sunflowers. I smiled. I remembered playing in Maximilian sunflowers when I was little. I started to type. Chip cavorted through the yellow flowers, then pounced. Seconds later, he came prancing up with a stick. He sidled into Martin, knocking him off balance, and whipped his bushy tail back and forth. Yellow petals went flying like confetti. Then Martin looked up and saw the ruined skyscrapers of the abandoned downtown ahead of them. When he saw them, I could see them, too. About a mile away, a cluster of thin buildings reached improbable heights, as if some giant hand had come down from the sky and pulled them toward the heavens. Some were faced with polished stone, still stylish and dignified. Others were faced with panels of mirrored glass. These had shattered and left dark squares here and there, so that their sides looked like surreal chessboards. Flocks of birds swooped in and out and gave their solid lines the illusion of movement. I thought about that for a quiet minute—that ruined city. The phone rang, and my view resolved once again into two unconscious cats and my green backyard. But I didn’t wince as I answered it. My life contained plenty of peace nowadays. My black sheep daughter, too settled. That idea felt so good that, mentally, I took off my shoes and ran barefoot through it. Valerie, settled and comfortable, like part of an old married couple. Yellow petals whirled into the air around me. Ruins, yes. The ruins of old structures, old habits and old ways of being. But from the ruins, new flowers were springing up. Life and growth was all around me. Text copyright 2015 by Clare B. Dunkle; text courtesy of Chronicle Books. 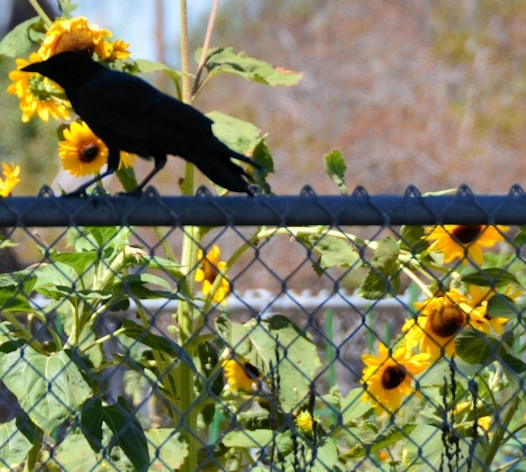 Photo of a crow in front of Maximilian sunflowers, Berkeley, California, copyright 2014 by Joseph Dunkle. To read my latest blog posts, please click on the “Green and Pleasant Land” logo at the top of this page. This entry was posted in Anorexia nervosa, Jungian archetypes, Story creation, Writing craft. Bookmark the permalink.